Two Uttar Pradesh sisters have set up a mini shrine in their home to "worship" Priyanka (pictured) and Rahul Gandhi and pray for their electoral win. Barabanki's Tripathi sisters want "Rahul Gandhi to be our next Prime Minister" and his sister Priyanka to "help him just like Lord Krishna helped Arjuna in the battle of the Mahabharata”. The pictures of the two Congress leaders appear alongside images of other Hindu gods and goddesses in their shrine. This isn't Priyanka's first godly elevation. Congress supporters in Prayagraj had put up posters in which she was seen as an avatar of Durga. The posters had said, "Congress ki Durga, shatruon ka karegi vadh" (Congress’ Durga will slay enemies). 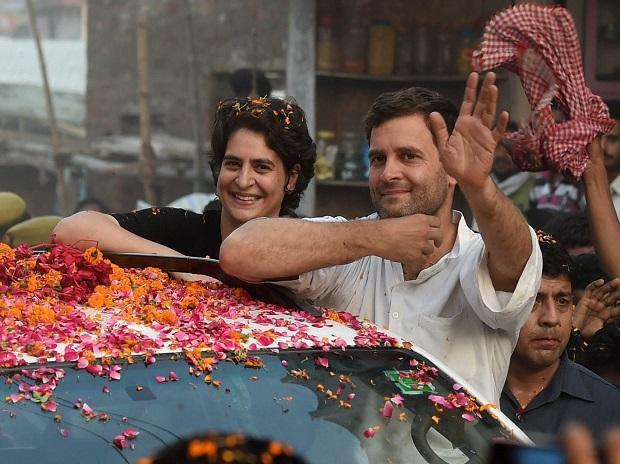 Posters had also come up in the prime minister's constituency, Varanasi, and UP Chief Minister Adityanath’s hometown, Gorakhpur, urging Priyanka to contest the Lok Sabha polls. The Varanasi posters had declared, “Kashi ki janta kare pukar, Priyanka Gandhi ho sansad hamaar." It would seem no one in the government conveyed to the Rashtrapati Bhavan it had changed the name of its health care scheme from Pradhan Mantri Jan Arogya Abhiyan to Pradhan Mantri Jan Arogya Yojana. The change had much to do with their respective abbreviations. The initial name abbreviated as PMJAA, which in Hindi translated into "PM go", while the changed name abbreviates to PMJAY, or victory to the PM. However, in his speech before the joint sitting of Parliament on the first day of the Budget session on Thursday, President Ram Nath Kovind used the earlier name PM Jan Arogya Abhiyan. "My government which empathises with this pain has launched the ‘Ayushman Bharat Yojana’ last year. Under the world’s biggest health care scheme, ‘Pradhan Mantri Jan Aarogya Abhiyan’, 500 million poor are eligible for availing treatment up to Rs 5 lakh per year per family in case of a serious illness. In a short period of four months, more than 1 million poor have already availed free treatment from hospitals under this scheme," the president said. Tribal face to save face? The Bharatiya Janata Party (BJP) is finding it difficult to appoint a full-time president for its Chhattisgarh unit. Currently, Dharamlal Kaushik holds two posts — that of the leader of the Opposition in the Assembly and the state head of the party. Since the defeat in the Assembly elections, the party has been desperately looking for a tribal face as its state unit president. The reasons are not far to seek. In the 90-seat Assembly, the party won just 15 and lost almost all tribal belt seats. Those in the know say names such as Ramvichar Netam, Vishnu Deo Sai and Vikram Usendi are being discussed for the post as no 'big' leader has stepped forward to take up the challenge.